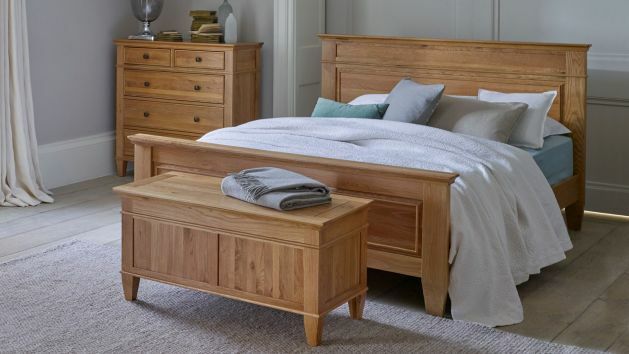 Our stunning collection of solid oak king-size beds is a perfect blend of comfort and style, ensuring the restful sleep you deserve. Comfort is as important as style for us so, bearing that in mind, we have some designed some stunning king-size beds. Each one has been beautifully crafted to add a touch of style to your bedroom as well as comfort, ensuring a restful sleep. All of our king-size beds will look fantastic when they are part of a full bedroom set alongside other bedroom furniture products from the same range. Each piece is unique and durable which will offer you years of comfort. We also have a range of single, double, and super king-size beds as well as a wide range of mattresses for you to choose from, including king-size mattresses designed to make the most out of your new, stunning, king-size bed. And don't forget about our free delivery and flexible finance options, as standard. Browse our selection and sleep like a true king!